We have had an "all furniture" branch for Castlevania: Harmony of Dissonance and an "all souls" branch for Castlevania: Aria of Sorrow. Why not a comparable "all cards" for Castlevania: Circle of the Moon? This TAS completes the game with all 20 DSS cards collected. Why not other "100%-ish" goals? This run can be understood and enjoyed without needing to read most of this long text. The "Game objectives" and the "Other comments" sections are intended for those who care about the author's decisions on goals/versions and justification of them as well as suggestions on possible publication/obsoletion work, especially for judges and publishers. The "Route planning and TAS techniques" section is intended for those who have general questions about the route/tactic choices of the run. The "Stage by Stage comments" psection art is intended for those who have specific questions about the route/tactic choices coming up during watching. Collects all 20 DSS cards in the game. Aims for fastest input time. Takes damage to save time. Aims for the Moon Tier. This branch fits the above. The downsides are that most of the collected cards aren't helpful in the run, and the game doesn't have any special indication that the collection work is done, compared to the Best Ending in HoD and the Chaso Ring item in AoS. Note: Collected cards may save some frames from moving the cursor to switch cards during the DSS activation glitch, or may save the entire switching process required by the glitch if they form the very combo to use. There are many other possible "100%-ish" goals definable for this game. For the details, see the dedicated section 'About other possible "100%-ish" branches' near the end of this text. I prefer this "all cards" to any of other "100%-ish" goals. Anyways, it is the author of the run to decide what goal to aim for, not the branches themselves. For this run, the (J) version is chosen because the lower EXP requirements in the (J) version allows for Nathan to reach slightly higher levels barely enough to take down some enemies fast enough and survive damage taken on the way, which wouldn't be made in the (U) version. The game has at least 3 versions: the original Japanese release (J), the North American release (U) and the European release (E). Besides the language localizations, there's a notable difference in gameplay which makes the original Japanese release unique: It takes much less EXP to LEVEL UP in this version than in other versions. In fact, it's the later releases that increased the EXP requirements for all levels by 20%, which makes usual gaming harder. Trivia: Yes, it is the tradition to make a Japanese game harder in its western localizations. More Trivia: It's said that there has been a re-release of this game in Japan, but I can't find much information about it and don't know if it changed anything in gameplay. If you draw on the same map all possible routes for this branch that aren't immediately abandoned, the graph won't look like a grid. That is because there are prerequisites for some nodes to connect. The planning works to reduce the lines on the map. Just as in many other games, spending less time in travelling is equal to faster outcome, in most cases. However, DSS menu operations are rather heavy in this run, so heavy that some ideas of potential alternatives are killed by it. Resource management is somehow more tolerant in games with an inventory and random drops like this, in the sense of possibilities to achieve some objectives, but often turns out to be more intense when perfection is pursued. In making this run, "what", "how many", "where", "when" regarding the HP, MP and Hearts resources have been questioned and changed many times, just for 1 or 2 potential frames. It might sound strange, but the micro optimizations and route planning might be carried out at the same time. The PRNG of the game isn't copy-paste-friendly. It is rather chaotic, which could be a good thing, as no arbitrary sequence of "random" events seems impossible. which could be a bad thing, as sometimes there will be no clue at all on how to get things done. And it is indeed a big disvantage that modifying virtually any single frame of input will ask for redoing everything behind that point. Under situations like this, there's no difference whether the change is small or big. Any change = redo. But don't worry. The small improvements weren't flooding, and the big got steadily cleared and reduced to only one. For some reasons, some rooms belonging to an area doesn't flag up for visiting that area. Examples are the "Iron Maiden rooms" (except the one in the Chapel Tower). There are 10 "Action" cards and 10 "Attribute" cards in the game. Each "Action" card can only be dropped by a single corresponding enemy type. Each "Attribute" card can be dropped by one or two corresponding enemy types. Some of the areas above must be accessed anyways as they are in every possible route as explained below. To open the portal in the Ceremonial Room to the final fight against Dracula. To defeat Adramelech in the Chapel Tower to destroy the "Iron Maiden" obstacle in the entrance of the Underground Gallery area. To defeat Camilla in the Underground Waterway to let the Tricky Candle enemy spawn in Cerberus's room. To defeat the Dragon Zombies in the Underground Gallery to let the Scary Candle enemies spawn in the Iron Golem's room. Other event triggers are unneeded or can't be missed at all. The TACKLE behind the Necromancer in the Audience Room required to break the blocking boulder in the Underground Gallery area. The DOUBLE behind Cerberus required to do the "Infinite Acsension" glitch (see the note below and the Stage by Stage comments on "Top floor of the Abyss Stairway"). The DASH BOOTS in the first room featuring an Earth Demon in the Catacomb area to double walking and running speeds on ground. The ROC WING behind Camilla to do infinite hi-jumps rather than to resort to "Infinite Acsension" or even worse "fall until it wraps around". The HEAVY RING behind the Dragon Zombies to push a way blocking boxes at the western exit of the Underground Gallery area and in front of an Arch Demon. The KICK BOOTS behind the Irom Golem to do wall-jumps. The CLEANSING behind Death in the Underground Warehouse to dispel the damage from the water in the Underground Waterway. The LAST KEY behind Hugh Baldwin in the Observation Tower area to legitly open the door to the Ceremonial Room. The route must cover all of the required triggers and Magic Items as well as helpful ones if they don't cost more time than they can save, which is the case in this run. Note: Technically speaking, it's possible to skip the DOUBLE together with the "Infinite Acsension" glitch at all by using very complex "DSS-Timefrozen Damage Boost" tricks along the way to obtain first the TACKLE and then the KICK BOOTS in order to get to Camilla and maybe get the ROC WING, which would be a much distinct but massively slower route choice. It takes time to recover the HP, MP and Hearts resources. Their usage must be balanced with the recovery work. MP is only lacking when Nathan is at low levels or when it has been drained up in the Battle Arena, since most frequently used DSS spells don't cost too much of it. All MP-items in the inventory recover MP according to a percentage of Nathan's current MP capacity, and MP Max Ups that increase the MP capacity by 10 also refills the whole MP bar. There's no need to use Save Rooms only to refill MP, but also to refill HP as well. Hearts management looks hard at first glance. The Axe subweapon costs only 2 points per shot but it isn't used much. The Cross subweapon in use is Heart-hungery that it costs 6 Hearts points per shot. Small Hearts from candles and torches only recover 1 point for each, Big Hearts from from candles, torches and enemies recover 5 points for each, And even the Heart Max Ups only restore 6 points as well as increase the capacity by 6 for each. Inventory items may recover a certain amount depending on their kinds. Save Rooms don't refill any Hearts. Fortunatley, the initial store of Hearts, the free Heart-collecting work during the waiting in Cerberus's room and the various luck-manipulated drops from enemies give enough amount for all use of the subweapons, and there's instance to "balance out" any use of them. HP management is the most complex of the three. There are many enemies on the way that Nathan shall take damage to run past for the sake of speed. Some of them hit badly even for a high level of Nathan. The Underground Waterway also depletes the HP quickly according to the current HP capacity without the CLEANSING Magic Item in a strict way that the accumulated errors resulted from truncating the amount of HP drained each time to an integral value is compensated by increasing more at times. All HP-items in the inventory recover HP by fixed an amount depending on their kinds, and HP Max Ups that increase the HP capacity by 10 also refills the whole HP bar. Save Rooms can be used to replenish both HP and MP if other methods fall short of the needs. Sometimes the resource have to be saved in exchange of use for gains of frames, if there are no directly-restore items that cost little-to-no time to pick up, or the capacity limits how much resource can be prepaired for the situation as all use of inventory items must be done together with DSS card selections to avoid extra menu accesses. In case there aren't enough items for the resource, either for direct pick-up restoration or in the inventory, the Save Rooms can be used if they aren't too far away from the main route. Equipments in this game only affect the STR, DEF, INT, LCK stats of Nathan and doesn't change anything else, except for the secret Bear Ring that changes the DSS Skeleton morph into a cartoonish bear and is not useful in this run. STR is the most useful as it directly affects the power of almost every attack except for some DSS spells. DEF can reduce some damge taken from enemies, but not so critica. INT only increases the speed of automatical MP regeneration and it doesn't quite matter at high levels. LCK affects the chance of item drops and it doesn't quite matter in a TAS since there is no threshold of LCK for any drop in the game. Equipments boosting the STR are the most important to consider about even at the cost of some other stats, if and only if they can speed up any fights. Equipments focusing on boosting the DEF are only considered if they help with HP management and don't conflict with the need for STR. Equipments focusing on boosting the INT are only considered for the early part of the run. Equipments focusing on boosting the LCK are only considered for their other stats boost. There are some good enough ones right in the way and it isn't worth the time to go out of the way to loot anything else. Equipments that don't increase the STR, and only increase the DEF too little to help with HP management or INT too late to help with MP management, are not listed here. Gauntlet STR+15 #1,#5,#10,#14 "popular among enemies"
Wrist Band STR+5 #1,#2,#3,#6,#7 very "popular"
Magic Gauntlet INT+10 #1,#7,#10 "popular"
Prison Garb STR+5, DEF+20 #1,#2,#3,#5,#6,#10 very "popular"
Some equipments are really effective in fights but they unfortunately require making too long detours to acquire. The Shinning Armor is a notable example of this as it doesn't save more time overall than it costs to be acquired, despite its slight STR boost, great DEF boost, and high receptions among the players. The "popular among enemies" drops such as Prison Garb and the Prison Garb can't speed up any fights before they get obsoleted by superior equipments. Some equipments may look nice but Nathan can usually have superior equipments by the time their holding enemies are encountered. INT-boosting equipments in the early gameplay aren't competetive against MP-replenishing strategies, and quickly obsoleted due to the route choice that builds up the level very soon. So they aren't useful either. In the end, only two Strength Rings from Were-bears in Eternal Corridor and a Night Suit from Killer Bees in Underground Gallery are targeted. The former takes some time to obtain and the latter is almost cost-free. TODO: Improve this terrible table. In the end, the Triumph Hallway, Underground Warehouse and Observation Tower areas as well as the KICK BOOTS, CLEANSING and LAST KEY Magic Items are skipped in the final plan. Usually, when Nathan starts falling down, he will be set in the "falling" action, which is of a size between "standing" and "crouching". However, if Nathan starts falling down when he is doing a crouching attack ie. normal or morphed whipping uring crouching, he won't be set in the "falling" action until the attack ends. During the "crouching + falling" action, Nathan can steer to left or right as if in a normal falling action, while keeping his size the same as normal crouching, which allows him to fall into narrow openings on walls which are intended only to be slide out of. This trick is used in this run to enter the Battle Arena from an "escape-only route" of it. Nathan usually loses the running speed if he is commanded to change the direction in the air via input. However, if the input to control the direction is only changed during a period when Nathan can't move at all, he will successfully change the direction while keeping the running speed. The unmoveable period can be the in-game menu, map screen, level-up pause, descriptions of acquired items or just room transitions etc. Sliding off an edge will instantly set Nathan to the "falling" action, interrupting the sliding. This can be advantageous as the slower part of the sliding is skipped. And since the game allows Nathan to fall back onto the same edge without jumping as long as he isn't off too far away, he can repeat doing this and keep damaging enemies with the range of the sliding attacks. This trick is used in the run against the Ice Armor in the Underground Waterway area. Similar to the above trick, getting hit during a sliding attack will interrupt the sliding and set Nathan to the "hit stun" action. The hit stun is usually shorter than the rest part of the sliding attack as long as the hit doesn't send Nathan flying from the ground. The invulnerable time gained from the hit is also advantageous in many cases. This trick is used in the run against many enemies on the ground. Attacks directly conducted by Nathan all depend on a shared variable that controls the damage cooldown time. For some reasons, the cooldown time used for Nathan's sliding attacks is uninitialized and always retains that of the previous attack. By whirling the whip, the cooldown time can be reduced from normal 30 frames (as lashing) to 15 frames (as whirling). Big Hearts drops from enemies are actually meant to replace DSS Cards drops, and only such enemies may drop Big Hearts. To get a chance to get a Big Heart from such an enemy, you must have already acquired the enemy's corresponding DSS Card, or play in the Fighter Mode. If Nathan is very close to the top of a solid object where he can land on, he will zip forward for one frame when he lands. The closer Nathan is to the top, the farther he will zip. By selecting different DSS cards, even if they aren't acquired yet, when activating an existing DSS card combo, the newly selected combo will be in effect instead. Almost every single run, or even casual gameplay nowadays abuses this, except in Fighter Mode. It might be old but I don't recall seeing it in other runs. Recite from the glitch-warped "any%" run: Wall ejection is not paused when Nathan is activating DSS card combinations. Since the activation is long, doing this saves the time for wall ejections. Subweapons keep moving during Nathan's DSS activation. While not hitting anything, they can change their positions related to paused enemies. This small trick is used in this run for performing the "DSS-Timefreeze" glitch in the Iron Golem's room. Triggered by activating the DSS right when Nathan's foothold disappears. This glitch makes Nathan the only active entity and everything else in the game world is frozen in the DSS-activation pause forever. The freeze can be dispelled by finishing a full DSS-activation. Frozen sprites will stick to their positions related to the screen, as if they were all pasted on the camera. Once unfrozen they will immediately return to their true positions in the game world. However the "solid block obstacles" such as pushable boxes aren't "pasted on the camera" during the freeze: their true collisions are put on a differnt layer so that they work really like the true ground, ceilings and walls. Some frozen entities, notably enemies' damage and other hazards, can still affect Nathan as usual. Doors' opening/closing can be triggered during the freeze but only brought to action if the freeze is over. Used once in the run to avoid getting locked in the Iron Golem room due to the "Enemy Replacement Corruption" glitch. Its presence is widely known as in "Mars + Black Dog" 4x-attack-power Thunderbird/Cockatrice summoning. Not only does the game wrongly compute the STR with the card combination currently selected (except for certain attacks), but also does it change the attribute of the attack to that with the current card combination. For some reasons, players often seem to neglect the fact that this glitch works with the big-bones thrown by Skeleton against DARK-attribute enemies, which can save some time against many DARK bosses in the game. DSS-summoning spells are the roots of several useful glitches. When Nathan casts a DSS-summoning spell, the game memorizes his vertical position related to the current room and will pull him there when the spell ends. If Nathan touches a room exit and transitits to a different room, the game will still pull him the same memorized vertical position errorneously related to the new room, which will send Nathan through the space to the wrong height in the new room. The on-ground version of this glitch can be used for reaching room exits from outside of the room boundary, as the game always move Nathan vertically to the middle level of the screen during the summoning, and back when it ends. All hail to the Skeleton! When Nathan is in the DSS Skeleton form, any status ailment is ignored as if the status were GOOD. In addition, the DSS Skeleton form is immune to the water damage in Underground Waterway even without the CLEANSING Magic Item. This run only utilizes the ailment-ignoring glitch in the Adramelech fight. Nathan can only transform from the DSS Skeleton to human form if he is neither performing an attack nor in the air. By keeping attacking, jumping or falling, Nathan can stay in the Skeleton form even if he had run out of MP or unselected the DSS combo. An plus is that Nathan will have normal DEF calculations in this state, which means he will no longer take the hard-coded 9999 damage from hits. He will morph back to the human form if he gets hit in this state, though. This just allows the all-mighty DSS Skeleton to "slide" forward on the ground while throwing a bone. Triggered if the Skeleton have any horizontal momentum just before landing and attack on the next frame. This just allows the all-mighty Skeleton to walk in the air. Triggered by ending the DSS Skeleton attack when Nathan's standing ground disappears. This could be done by removing the standing ground or using the "Skeleton Sliding Attack" to slip off an edge at the right frame. These are glitches derived from the "Skeleton Levitation" glitch. After the "Skeleton Levitation" is activated, Nathan can transform back to the human form and keep hovering in the air, in which state he can only make air-jumps but not ground jumps. The air-jumps will be so glitched that the gravity is nullified, and once Nathan leaves the ground, he will keep the initial ascending speed rising until he either bumps into an obstruction or lands on its top (see "ascension through ceilings" below) and stops there. If Nathan changes makes any action that sets the gravity eg. using the whip in the air, he will deactive the glitch and start falling as usual. When Nathan is in the "Infinite Ascension" status, he can change his vertical size by crouching down and standing up. This allows him to slip past upper exits of the room under with precise movements. It's also possible to use a Hi-Jump when crouching to make this easier, which is unused in this run. Just working like the "ascension through upper exits" glitch above with higher precision requirements and not with a Hi-Jump, as long as the ceiling to get through is not thicker than half of Nathan's stature. Note that even after Nathan "lands" on the top of the roof, the air-jump count will not be reset properly until he ever falls at least once to land again. If events are not triggered, they won't ever come to play. Sometimes the triggers themselves have some prerequisites to activate, and/or will be disabled if or some flags are set. For example, the triggers to lock doors of boss rooms all require the intended "entrance" door fully closed to activate, and will be disabled if the bosses in the room are flagged as defeated. Nathan could be able to do some tasks in these rooms when the triggers are still inactive, and maybe set the flags to disable them, so that the corresponding events could be skipped. This trick is used together with other techniques in the run to skip the conversations around the Necromancer boss fight, as well as to leave the Iron Golem room before the doors get locked up. See corresponding Stage by Stage comments for details. If Nathan somehow moves into the wrong place during the scene, the scene will keep playing even if room transitions occured. Nathan will try automatically to move to a specified X position if the scene contains a script to move him. There is no way AFAIK to interrupt a scene except to kill Nathan and get the Game Over screen. This trick is used in the run to misplace the dialogue after beating Dracula in the Ceremonial Room, in order to save some travels. Note: The term "door" here not only refers to the gray-ish flipping "iron" doors/gates that usually separate areas but also to the blue-ish "magical" shutters/gates that close the exits of a boss or arena room, whilst the term "shutter" only refers to the latters. Doors tend to stay closed until they are opened. An "opened will-close" door is kept open as long as Nathan is within a certain horizontal distance from it, and it will automatically close as soon as Nathan moves out of this so-called "inductive range" or "sensing range". Boss room gates, or said shutters, are somewhat special as they also have a "locked/unlocked/removed" state. Shutters are "unlocked" by default, and can be "locked" only when the "lock"-triggering gate has "closed". If the corresponding "this boss defeated" flag is set, boss room gates will stay "open" and virtually "removed". When the room is loaded, all doors in the room will normally be initialized "closed" by default. Only doors flagged "removed" as mentioned above or the said "inductive range" of which Nathan is within will be initialized "open". Anyways, Nathan can only touch-to-open an "unlocked" door, not a "closing" door or a "locked" door, as the "touch" part is ignored if the door is "closing" and the "open" part is disallowed if the door is "locked". In this game, whenever Nathan is supposed to be locked in a boss room or an arena room until he wins the fight, only the gate intended by the game developer where to enter the room can trigger the "lock" event. As long as that gate hasn't gone through any "close" action, all of the shutters in the room remain "unlocked". This can be done if Nathan can just stay within the "inductive range" of the "lock"-triggering shutter, which is often called the "safety zone" in context of such glitch exploits, or use the "DSS-Timefreeze" glitch to pause all of the shutters. The glitch is used in the run to skip some lengthy parts of the Necromancer fight and to escape from the corrupted Iron Golem room. Interestingly, the "unlock" action triggered after Nathan beats a boss or arena room not only unlocks all of the shutters in this room, but also open all of them in one go surpassing the "inductive range" range check. For some reasons, the game developer implemented it in such a way that the game remembers this piece of action and will blindly apply it in any room with such shutters and then mark it off. So if the "unlock" trigger is activated in a room with no such shutters in it thanks to the "playing event scenes in the wrong places" trick described above, the game will just defer the "open all shutters in the room" action till it becomes applicable, making it possible to remotely open all of the shutters as soon as Nathan enters the room. This glitch is used in this run to defer the "open all shutters" action after the first Dracula fight to remotely open the shutter in front of Camilla, saving the need to touch it and wait for its opening. It could be used to open other shutters, notably the one before Adramelech where touching it triggers a dialogue with Hugh which thus could be skipped with this glitch, but the route choice in this run simply doesn't allow them, or they would be too slow to set up. The new ones could have graphical errors. The old ones are indeed dettached from the game logic, but still have their corrupted entities stuck in the memory and errorneously attached to (or "possessing") everything that happens to reuse those slots. If the old ones eg. the bosses, are keys to some event triggers eg. "to open the boss room doors", you'll be unable to trigger the events any longer. This glitch is (in-)famous as the cause of the "Outer Wall Spectre", "Ghostly Cerberus" and "Iron Golem in the Top-Left Corner" that come to damage Nathan now and then. It is usually unwanted even in glitched speedruns, just as a penalty for sequence-breakings. To remove those "haunted" effects in gameplay, just save and load the game: The corrupted entities will be wiped out this way. In this run it is abused to skip te Iron Golem fight but also causes some trouble and has to be handled later on. Some glitches are not as useful as they might appear. When Nathan is tight against a box/boulder, he can get hit and tossed away by executing the TACKLE action facing away from it. While looking cool, this glitch never saves time in a speedrun even in the Fighter Mode where DSS-dash is unavailable, due to the high cost of time to recover from the toss when Nathan stops rolling on ground. 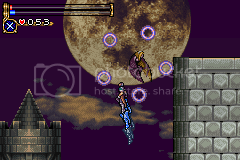 In the final fight against Dracula, if Dracula's HP is decreased to 0 in his "humanoid/demon form" instead of the "eyeball form", the long "morphing back" animation before his true death animation will be skipped. However in this run, it would take 3 more DSS card switches to perform this, which would cost more time than it could save. When the "DSS-Timefreeze" is effective and there are enemies "pasted" onto the camera where Nathan can touch and get hit by them, it is possible to utilize them for portable damage-boosts along Nathan's travels. If Nathan is standing high close enough to the ceiling that is not thicker than half of his stature, he can jump through the ceiling in the Skeleton form. This glitch is obsoleted by the new "ascension through ceilings" glitch described below. Like in the case of in wall ejection, "Infinite Ascension" is not paused when Nathan is activating DSS card combinations. Whereas it looks kinda cool, this trick hardly has a chance to save time in a speedrun, as the activation takes so long that Nathan will ascend way too high in most use cases. TODO: Timestamps for easier seeking in the movie. Some small alternatives choices of possible routes and tactics will be described for some stages, someimtes in the notes. The bigger branch forks of the overall routes have been cut off entirely, so they are considered not to be part of this run, and thus not described in this text. First, Nathan is going to recover the ability to run with the Magic Item DASH BOOTS, and then gain the ability to air-jump with the Magic Item DOUBLE (aka. "Air-Jump Stone"). Nathan can be controlled by the player after the dilogue with Hugh ends. The input to clear this room is the same as that in the "any%" run. Same tactics used as in the "any%" run. Trivia: This room and the previous one belong to an unnamed area in the game. Recite: Sliding is faster on gorund and slower on 45-degree slopes upward than walking. What if it's on half-ground-half-slope? It depends on the situation, and here it's still a bit faster. I need 5 Potions, 1 <Salamander> Card (FIRE, 1/20) as well a Big Heart from the Skeletons (FIRE). I could have 2 Big Hearts in this room and save for later on, but that would create excessive lags. So just luck manipulations without losing time. Oh and the <Mercury> Card ("strength", 2/20) from a Bone Head as well. The one near the bottom of the room is a quicker target. Falling with an offset to the left on the bottom floor doesn't waste any time eventually, as the optimal count of slides to the DASH BOOTS in the next room is a fixed number, and the offset will be fully covered. This offset allows to accomplish this section of intense luck manipulations. Note: There's an alernate route to reach Cerberus from here: You can utilize the enemies in this room to reach the Abyss Stairway area with the "DSS-Timefrozen Damage Boost" trick. which turned out to be much slower according to my tests as we have to get the <Serpent> Card (see below) and the DASH BOOTS first in this area. As a result, the "intended route" through the Catacomb is taken instead. The Earth Demon (EARTH) is too tough and the only efficient attack is the DSS Skeleton's big-bone. So it's big-boned for the <Serpent> Card (ICE, 3/20). Yeah the attributes are correct, and I think you are comfortable with that. Activation of the DSS-dash combo is delayed until Nathan reaches the higher platform in order to avoid wasting MP during some jumps that wouldn't benefit from the combo at all. The MP resource is still short and we'll see some measure to replenishing it later on the way, other than to get from Poison Worms etc. and put on some Magical Gauntlet(s) that wouldn't help enough. Note: Only the Holy Armors (HOLY) in the the Underground Warehouse area can drop the <Serpent> Card besides the Earth Demons, where Nathan wouldn't go at all in this run. Some minor adjustments are needed to clear some platforms. Otherwise nothing worth mentioning. The Skeleton Bomber could give a Big Heart, but that would be unecessary (see later in the the Chapel Tower). I obtain a Mind Restore from the Mud Man (a rare enemy type in the game) for relaying the MP when reaching Cerberus. Platforming is optimized in a way that Nathan can jump down with running speed. Note: It might be tempting to use the Save Room nearby to replenish a full bar of MP, and seemingly even to skip taking the MP Max Up later. Unfortunately, that wouldn't work even with a spare Mind Restore, as the current MP capacity is far too low to reserve enough MP for the 3 consecutive DSS-summoning spells required before Dracula, after the all-the-way running till then. It could seemingly avoid leveling up twice when beating Cerberus. It could indeed skip the waiting after beating Cerberus. It would cost quite some seconds to set up. It would skip all Hearts available in the boss room if no further time cost were to endure. but also when Nathan were to come back for the <Pluto> Card, to glitch with the Trick Candle and lock Nathan in the room forever, unless the DSS-Timefreeze glitch had been used again before the door shut down, and even then to haunt Nathan for the rest of the run. Nathan would actually level up anyways, just later. Note: Similarly, getting the MP Max Up in the room with Hoppers in the midway with the current MP capacity wouldn't work. Nathan manages to get in front of Cerberus before he runs out of MP. The Mind Restore is used for reactivating the DSS. It is needed anyways for later DSS-dash. Yes to the big-bone to the watchdog. No to the "Diana + Griffin" DSS wind-arrow attack which would reduce the MP to sub-zero. All hearts in the room are collected. Trivia: Cerberus has HOLY attribute. It doesn't drop anything though. Continue on the quest for cards. Go back to take down Count Dracula first for some EXP and LVs and then resume the "main quest". The latter is chosen in the run as the benefit from more spare HP and MP as well as much higher STR and DEF to speed the card-quest overwhelm the cost of the detour. So let's go back to meet our old friends again. First of all, Nathan is still running out of MP. The only practical option is to get the MP Max Up in the Hopper-infested chamber next to the U-shape room that we skipped before Cerberus. And then we may leave this area at full speed through the L-shape room of Coffins and Mummies. It's possible to glitch upward from here directly or go down the room first and glitch-zip up here then, but the benefit from fighting Count Dracula early can't be neglected, and even the route from here isn't so fast as it appears, since it would take almost as long to enter the topmost room of this area as to arrive at roof of the beginning room, and then the slow zig-zags travelling in the topmost room couldn't be helped. So let's take the way back in the Catacomb area again. Note: There is an Arch Demon for the <Apollo> Card in the 3x1 chamber on the right side of the 3x3 room, while it is possible to glitch onto the roof with DOUBLE at this point, they wouldn't put their cards where Nathan could reach without the HEAVY RING to push away some blocking boxes. With dash and air-jump abilities, this part is much faster than that is in glitch-warped runs. Still, I optimize the platforming part carefully as well as the timing of DSS activation during an edge ejection. Go left to continue on the quest for cards. Go right to take down Dracula first for some EXP and LVs and then resume the journey. So I just zip to Dracula, ignoring the gate that is only supposed to be opened with the Magic Item LAST KEY (skipped in the run). Trivia: The long dialogue before the boss fight cannot be started as long as Nathan doesn't enter the Ceremonial Room in the intended way. What an old trick that no one ever questions about it. 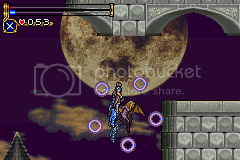 I use the attribute glitch to double unhalve eveny big-bone's damage, which helps using 1 less bone on Dracula. The glitch doesn't cost any time as I'll have to switch the cards for a later activation anyway. The "Skeleton sliding" glitch is used as well for the second big-bone-throw to hit Dracula 3 frames earlier. When Dracula kneels down, the "Hugh rescuing the master" event scene will be triggered, and the portal (the "stream of light") to the final fight will be opened. If the scene weren't played, the portal would never get a second chance to be opened, and the game could never be finished then. Thus the only optimizations here is to quit the room to trigger the scence in the wrong room, so that Nathan can utilize the scripted movements in the scene and move less later. The "open all shutters" game command emitted at the end of the scene can be reserved to remotely open the shutter to Camilla later. Moreover, the free time waiting for the scene to start can be used to prepair for rapid sliding attacks that will be used against later enemies. Q&A 1: Why not slide to the right to quit the room? Because Nathan can only take the room exit by going left when he is on the right side of it. Q&A 2: Why not fight inside the room in the first place and then side to the right to quit the room? Because the time a single sliding attack saves compared to walking isn't worth the cost to set up for it. Now, Nathan has higher HP capacity, so the potions can be used to afford some more HP for new areas. According to the opening scene, it shouldn't have been too long since Nathan ran through this area with his pals just minutes ago.... Never mind. <Mandragora> Card (PLANT, 4/20) is acquired from the lone Axe Armor in the second room, who will be replaced later with tougher enemies. Due to the route choice in this run, they won't be seen, though. Now we may see what the "ascension through ceilings" glitch looks like. It's the faster way to reach the upper-right exit than any other, such as to use the "ascension through upper exits" glitch and the classic "use enemies as platforms" trick. Note: Nathan's air-jump counter fails to be reset as he never actually "fall to land" on the roof. This prohibits doing new ground/air jumps until the counter is reset. The corridor is quite long. The air-jump counter gets reset when Nathan slides off the roof and falls back into the first room. The Were-bears can drop the Strength Ring, and the Beast Demons can drop the Cursed Ring. The Strength Ring is obviously the superior choice in STR (+50 vs +30) and I loot two of them. The rapid sliding attacks take the monsters down pretty quickly. Just 3 slides for each one. It's slightly faster to get hit by an Evil Hand and run past it than to jump over it, if you do not end up getting grabbed by it. Only the second one in the way is at the right height where it can't grab Nathan. So the other two have to be jumped over. There's the path to the the Underground Gallery. We'll come back later. Now there are more paths to go. We'll pay Camilla a visit before going to meet Hugh again. The Warp Room on the way will be a shortcut later. It's slightly faster to activate now than when we are back. So the small detour occurs. The key reason why we are here is we need Camilla defeated in order to let the Trick Candle spawn for its unique card. Getting the extra EXP, the ROC WING Magic Item and the <Griffin> Card is a plus. This area is intended to be accessed from the other entrance, whilst we are accessing it from the "exit". Trivia: It's unclear whther the developer intended to make the CLEANSING to disable in-water damage optional, since the "flashbacks" shown in the Staff Roll doesn't include any scenes of the areas required to access in order to obtain the CLEANSING. The only way to get over the tall wall right now is to use the "Infinite Ascension" glitch. So be it. DSS dash is not reactivated after the "Infinite Ascension" glitch because its time cost would be greater than it could save. The wall broken is just for fun. I have to use the Save Room to replenish some HP. It could be done when going back but that would be slow. Just slide on the ground to save some time before walking to Camilla. She can't be easier with a non-DARK big-bone. The 2 Strength Rings are equipped after the fight, and the very useful ROC WING that enables the hi-jump ability is acquired. The pixel position of Nathan affects whether he can run down through the gap between the platforms, just as in the Gamma-shape room back in the Catacomb. This area hasn't been done with as there is still a DSS card to obtain from this esatern end. So the travel inside this area continues deeper. For whatever reasons this room is laggy and asks for reduction work. The Sirens (WIND) here drop the <Griffin> Card (WIND, 5/20). That's intuitive. The hard part is that the entire flying trajectory of the unlucky Siren has to be manipulated to the extrem to be optimal. This conributes to a lot of rerecords. The (J) version gives Nathan a high enough LV to whip down a siren in two blows with 2 Strength Rings equipped, which makes this part very concise and neat. With careful adjustments on Nathan's horizontal positions landing in the shallow waterway, the last Lizardman in this room is run through at the last frame of invulnerability resulted from a previous hit. This room is still laggy. Note: It's possible to do some tiny horizontal zipping when Nathan lands on the moveable stairs (the boxes chained diagonally) that are contrallable with some switches. Unfortunately, that would thwarts both the lag reduction work and more impotantly the adjustments for getting past the last Lizardman unharmed by it. The pattern of the hi-jumps are optimal. Trust me. The Bone Towers attack at fixed times. Nothing to manipulate with them. Just to maneuver through their fire spits. The acrifice some HP to get through quickly. At the room exit to upper floors, Nathan casts again the super zipping DSS-summoning spell(s). In fact one cast is sufficient for zipping up two room when the positioning is done right, sweet? Note: There are also Arch Demons for the <Apollo> Card presented in the two 2x1 chambers on the way up, but just like their buddies in the Catacomb, they wouldn't put their cards where Nathan could reach without the HEAVY RING to push away some blocking boxes. The Thunder Demons (ELECTRIC) here drop the <Manticore> Card (POISON, 6/20), huh? Since this is the only chance they appear in this run, I have to wait some time to take down one for the card. Another DSS-summon zipping has launched Nathan onto the roof. This approach is just a few frames faster than going inside this room with DSS-dash activated two rooms earlier. The first Bloody Sword (POISON, surprisingly?) must be manipulated to thrust at the optimal angle to minimize the waiting time for Nathan to get past it. I could acquire the <Mars> Card from the second Bloody Sword at the cost of just 2 frames now, but decide to get that card later at even lower cost. In order to successfully take the planned route through the Battle Arena, 3 items to recover some MP are required, which turn to be Mind Highs dropped by Marionettes in this room. Since I will revisit this room before entering the Battle Arena, I can choose which Marionettes to drop the items for optimal movements in the two goes. Moreover, the CURSE ailment resulted from contacting a Marionette won't cause any troubles in the incoming boss battle. Likewise, I could acquire the <Thunderbird> Card from the Were-panther at this point, but it will be faster if done later. Meet Hugh again and prepair for a fight against the boss. Note: It is possible to utilize the Save Room on the top left to skip the event that Nathan sees Hugh get thrown out of the boss room and so on. Unfortunately that would just be slower. So this guy is disposed with a big-bone. The whole point to fight it is just to activate the trigger behind it, to destroy all obstacles that look like some infamous "Iron Maidens". Again, DSS-dash is not used here until Nathan has the second conversation with Hugh outside the boss room, as the extra menu access for activation would cost more time than the DSS-dash could save. Note: I tested casting the Cockatrice summoning spell (more effective on this boss than the Thunderbird summoning spell) and then switching to "Mars + Black Dog" selection for 4x power, but that would be slower than a non-DARK big-bone, let alone that the CURSE ailment doesn't affect the all-mighty DSS Skeleton but does prevent from casting any summoning spells. Now the most luck-manipulation-intense part of the run. Just collect the <Thunderbird> Card (ELECTRIC, 7/20) from the Were-panther (DARK). It can no longer back-dash away from a sliding attack when it's on the slope. We are going to enter the Battle Arena area via its supposed one-way "escape route" at the bottom-left corner of this room. The method is to utilze the "falling in a crouching attack" trick on top of a frozen flying enemy as the platform, which requires Nathan to be able to perform a crouching attack, which means Nathan shall not get the CURSE ailment again this time. So the Marionette-field is no-damage cleared with the last 2 Mind Highs collected along the way down. There are two possible candidates as the platform for entering the Battle Arena: the Marionette sitting on the ledge above the "escape route", and an average swooping Bloody Sword. The Marionette can be manipulated to move athe right position for the trick more quickly than any Bloody Sword, So all Bloody Swords in this room are manipulated to stay out of the way, except the one chosen to drop the <Mars> Card ("change", 8/20). The Gorgons are manipulated as well that one will drop a Heart item that can be used from the inventory for recovering 10 Hearts. Fall to the left to land at the opening of the "escape route" in couching pose. This is complex and perhaps hard to follow in a video, but is faster than other tactics, including those relying sololy on the "Jupiter + Serpent" Cards ICE-shield combo to freeze and smash the frozen Marionette without using the Axe. Note: (J) version makes it possible to freeze the Marionette in just one ICE-whip blow, again. There is an enviroment effect in all rooms of this area except the entrance room on the west to drain up Nathan's MP very quickly. The immediate goal at this point is to get to the western side of this area from here. To do that, Nathan has to glitch out of the bounds of the current escape channel. To do that fast, Nathan has to recover some MP with a Mind High and then use the DSS-summoning zip on the lower part of the channel. The Heart item is used along, costing 2 frames, which is exactly the same amount as if 2 Big Hearts were collected elsewhere in the travel. Note: It doesn't matter which summoning spell is used. The enviroment effect to drain MP in this area will actually reset the amount of the remaining MP to zero, if it would become negative as resulted from the drain or a DSS spell. No need to fight any monsters here, since the "entrance-side" doors stay open as long as Nathan enter the "colosseum" rooms from the "exit-side". The Axe subweapon completes its last task and gets replaced with the Cross subweapon (aka. "Boomerang"). The detour here is primarily for the <Saturn> Card ("familiar", 9/20) from a rare and unique enemy Fallen Angel. She is very tough and has to be treated with a big-bone. She also has to be manipulated to fly in a favorable trajectory so that after Nathan obtains the HP Max Up for replenishing the HP, she still stays between the ceiling, low enough to for Nathan to catch her dropped Card in midair. This is another source of massive rerecords. The result works out perfectly. Note: The Legion hovering in midair has to be manipulated out of the way as well, but that is easy. Trivia: It might be surprising to people that this room out side of the Battle Arena belongs to the Outer Wall area, despite of the BGM being played here. To go into the lower-left sections of the Battle Arena from here, Nathan must get out of the bounds again. This time is to go with the "ascension through the ceiling" glitch in the first colosseum chamber. The prepairation must be done before entering it. The Stopwatch subweapon messes with the execution, but fortunately, Nathan can get back the Cross subweapon during sliding without losing time. A second Mind High is used to return from the first colosseum chamber, on the roof. And then Nathan falls down to glitch-warp to the "prize room". Note: it's possible to glitch-transition warp to other rooms, but due to how room transition and colosseum doors work in the game, it's the fastest to just warp to the "prize room" and go from there. The Shinning Armor is the only equipment placed directly in the castle. It advantages wouldn't justify the time cost to get it. So let's just ignore it. The Devil has to be manipulated to teleport out of the way as Nathan slides to the right. The White Armors (HOLY) here drop the <Unicorn> Card (10/20). The last Mind High is used to activate the DSS Skeleton. Thanks to the "Skeleton Maintenance" glitch, we need no more MP in the Battle Arena. Trivia: Surprisingly, this room is as hard to manipulate as the Fallen Angel part is, since here the drop must be right 1 frame after the big-bone is manipulated out, which virtually reduces the chance of the drop down to almost 1/8 of the original, for the sake of frame-perfection. The Devil Armors (DARK) here drop the <Black Dog> Card (11/20). Trivia: Surprisingly, this whole room is much easier to manipulate than the White Armors' room in all later revisions of the run, thanks to the evolution of route planning that obsoletes a Steel Armor to loot from the Evil Pillars here with a Night Suit to loot somewhere else later. Everything needed in the Battle Arena has been collected and it's time to escape from this place now. Just take the nearest exit. After sliding out of the Battle Arena into the shaft room, there's a MP Max Up ready for Nathan to immidiately recover from the exhaustion. And time again, DSS-dash isn't worth activating before the next boss fight. Note: Alternately, this MP Max Up together with the HP Max Up near the Fallen Angel could be skippid in exchange for using the Save Room underneath instead, which would be, of course, slower. There are many Electric Skeletons (ELECTRIC) in the halls before the incoming boss fight. The Electric Skeleton encountered first is to drop the <Golem> Card (EARTH, 12/20), and every following one is to drop a Big Heart each. The "ascension through upper exits" glitch is used again to get around the blocking boulder that can't be broken now. Meanwhile, "Saturn + Black Dog" is used to summon an Imp familiar, whose charged shots will do the trick with the boss. Note: To be slower, try to use the DSS summoning zip glitch to get outside the room boundary instead. Normally, there will be a long dialogue before the fight and a short monologue soliloquy after the long death animation of the boss. By shooting down the boss with long-range attacks without closing the boss door, the the dialogue will be skipped. Furthermore, by exiting the room before the death animation of the boss ends, the soliloquy will be skipped. These two tricks are done altogether at the door with the super-long-range fully charged shots of the Imp familliar at first, then some half charged Imp familliar's shots plus a Cross when the boss transforms into a demon and starts to approach Nathan, and Nathan leaves the room from the unclosed door as soon as boss loses all HP. The fire power is high enough thanks to Dracula's EXP, the 2 equipped Strength Rings as well as the possibility to reach LV 31 at this point in the (J) version. With all of these long stuff skipped, the TACKLE for destroying blocking boulders falls in our hands. Note: It's possible to take some time to set up the "DSS-Timefreeze" glitch to skip fighting the boss, but the long dialogue will still play when Nathan tries to leave the boss room by either of the two exits, resulting in the same long dialogue getting played at least twice in total for acquiring the TACKLE, which invalidates the whole point to do the skip: to try to save time. At last, every prerequisite for collecting all desired cards in the Underground Gallery area has been met. The AI logic of the Electric Skeleton on the top floor outside the boss room doesn't allow it to move out of the way, so it is looted for one more Big Heart as compensation for the damage. The boulder skipped just now in the next room can be broken through with the TACKLE. Since Nathan moves as fast during a tackle as he DSS-dashes, it doesn't matter when to start the tackle as long as the boulder is within the range. Nathan then uses the Warp Room above it to warp back to the Warp Room in the Eternal Corridor, and enters the Underground Gallery used to be blocked by an "Iron Maiden" at the branch road in the 5th room. We could collect cards only and leave without disturbing the boss here, but that would mean to take the whole back track through this area. Unlike the situation in the Underground Waterway, this would be too long, and it's faster to fight the boss, take the HEAVY RING Magica Item and leave from the western exit. The last Imp is placed too far from the first one to let Nathan run past during the invulnerability time. Otherwise nothing to mention here. Note: The Imps can drop the <Salamander> Card, which is obviously unneeded at this point. Nathan will need HP for the last part of run, so the Imps on the daises give him 2 pieces of Spiced Meat. The Death Mantes (DARK) here drop the <Cockatrice> Card (STONE, 13/20). Their action timers are manipulated for Nathan to run through them taking only the "contact damge" from their bodies, instead of the higher "attack damage" from their raptorial forelegs. The King Moths have to be manipulated to stay away as well, as their POISON ailment would drain even more HP. The boulder blocking in this room is the reason why the TACKLE is needed in an "all cards" run. Trivia: "Death Mantes" is the plural form of the noun "Death Mantis". A Night Suit (STR+20, DEF+60) from a Killer Bee is a good stats-boost for Nathan. The last Man Eater (DARK) gives the <Diana> Card ("creation", 14/20), as it is at the right distance take the most hits from a thrown Cross. Killer Bees cannot attack Nathan if he is attached to the ceiling, and can only keep advancing to miss him. Yes, it's faster to purge the boss instead of skipping the fight with roof-travelling beginning from the Save Room on the way up. You might notice the obvious zipping trick on the crumbling platform. There are two of them, and both can be killed with a big-bone. The difficult part is to manipulate every of their belongings in this room to cease animating as early as possible, which covers a wide range from the movements of the their necks to the timer of the festers on their bodies. This run gets the fastest possible outcome according to the game logic, again with massive rerecords. The Night Suit is equiped for boosted stats and Spiced Meat is used to maximize out the HP. Just like the King Moths seen earlier and unlike other enemies with poisoneous attacks, the Poison Armors' bodies aren't poisoneous to contact with. So Nathan can just run into them, take the contact damage and get past them withot getting the POISON ailment. Beyond the collapsing bridges is a blocking box. The only way to get past it is to push it with the HEAVY RING acquired, whether from the left or the right side. The box repays with a small top-zip, though. Now we are at the higher part of the Abyss Stairway and have obtained all useful abilities for collecting the rest cards. Get the cards in the lower areas first and those in the Machine Tower later. Get the cards in the Machine Tower first and those in the lower areas later. The former route is chosen for its requiring an overall shorter detour. Down the stairway wander the Skeletons. They are weak to take down with sliding attacks, but that would cost some frames each time. The optimal tactic is to manipulate them not to throw bones and then jump over them as shown in this run. It doesn't save or cost any time to whip them down. In the second room, Nathan can easily squeeze himself between the pairs of crumbling platforms and Bone Heads. No more Heart items are needed, and the drop is just fun fun. Nathan then enter the Underground Waterway from the intended western side. Still, Nathan doesn't have the CLEANSING to dispel the damging effect of the water, and gets hurt even harder this time as the damage is proportionate to the his increased HP capacity. Still,the remaining HP is sufficient for the rest of the run, so Nathan doesn't bother to manipulate damage-invulnerability time from the Mermen, but just keeps dashing to the next room. Trivia: "Mermen" is the plural form of the noun "Merman". The Ice Armor (ICE) here drops the <Neptune> Card ("healing", 15/20). Hiding behind a deep pool, it is out of the range of a Cross thrown foward for multiple hits. However, it is so close to the edge of the top platform that the "canceling sliding attacks by falling off edges" trick can be used on it for getting a higher rate of firing that has to be synched with the cooldown time. So is the "rapid sliding attack damage" trick used again. The cooldown time of sliding attacks is reduced with 1 frame of appended whirling after whip the Spearfish inside the pool, which is destined to be got rid of to avoid massive lags when dealing with the Ice Armor. The Cross is still used for its short recovering animation to finish off the poor Ice Armor quickly. After getting the card, there're nothing else to do here except to return to the Abyss Stairway. An Axe Armor drops a Big Heart here for 1 frame. It's faster to go straight right and then down than to make a detour underneath to return to the Coffins and Mummies room. After back tracking the old way in which we left Cerberus room, we are now back in it again. The <Pluto> Card ("special", 16/20) is dropped from the only Trick Candle monster in the game, which only appears after Camilla is defeated. Like other "candle type" monsters, this little guy is invulnerable to any damage until it is hit to be activated first, and then it jumps onto the ground and just disappears with nothing left, unless its HP is depleted before that happens. Under TAS conditions this guy is easy meat, and the optimizations focus on having Nathan leave the room with the card as early as possible. At last, no boxes can block the way and the Arch Demon has to hand over the <Apollo> Card ("explosives", 17/20). The Arch Demon is deep inside the room, with several Fox Hunters in front. Since the Fox Hunters deal less damage than the Arch Demon does, I use one of them to gain temporary invulnerability and run through the crowd with the card taken at the first frame possible. Note: Technically speaking, I could have collected the same <Apollo> Card from the Arch Demon near the entrance of the Underground Warehouse area after I acquired the DOUBLE, but that would take a very long time to get around the blocking box at the entrance of the area with only the "Infinite Ascension" glitch to help. This time Nathan has got the ROC WING, so he rockets upwards all the way. Note: It would be slower to use the good old DSS-summoning zip to get up to the beginning room due to two extra menu operations required to switch the DSS combos. To enter the Machine Tower area from the bottom and zip up inside to go to the upper floors. To zip up the tower on the Audience Room and then take the bridge to the upper floors of the Machine Tower. According to my tests, the "inside route" is faster and chosen for the run. A single long corridor with scattered lesser enemies to trade HP for invulnerability with. TACKLE is required to get through this room. Trivia: This room does belong to the Machine Tower area, but the area name never shows up here. Again, one cast is sufficient for zipping up two room when the positioning is done right. Let go of the ocassional card drop here. We'll come back in less than a minute. Running on the roof is faster as well as saves some HP from the Earth Armors. The Heat Shades which could drop the <Jupiter> Card are in the way, but it is faster to neglect them and collect the card elsewhere. Trivia: The blocking boulder could be broken from the left side utilizing the "Infinite Ascension" glitch, at some serious time cost. Nah, it can't be fought any more. Unlike Cerberus which will try to possess every sprite Nathan emits on the screen once it is overwritten by the Trick Candle, the Iron Golem will only quietly stay at the upper left corner of the screen once it is overwritten by the two Scary Candles. The doors will shut down and lock up once Nathan gets far away enough from the left exit. And the card dropped by the nearest Scary Candle is always far away enough. To ignore the door by using a DSS-summoning spell on the roof to trigger the room transition to get out. It's possible to ascend through the ceiling, but since there are no platforms, bumps or slopes in this room, the only choice to make up a disappearing foothold is to freeze the other Scary Candle not looted for the card, which is slow enough in addtion to the detour required to get back in the 3x2 room on the left. To prevent the left door from closing. This requires using the "DSS-Timefreeze" glitch to open the right door before both doors get locked up, then leave and re-enter this room via the right exit to reset the "left door close" trigger. The Scary Candle on the left side is used to do the glitch with precise timing. An extra DSS combo activation is executed to control the position of the Cross. Note: It's possible to do some complex tricks with the "DSS-Timefreeze" glitch in the previous room to carry the "DSS-Timefreeze" state here, but that would just take too much time compared to the tactic used in the run. When the left door has been reset, the Scary Candles can be dealt at will. The left one is chosen again as Nathan can open the left door while waiting for the Scary Candle to dive down to its demise. The time is still intense as Nathan can barely grab the <Uranus> Card ("summoning", 18/20) from the Scary Candle and get within the "safety zone" where the left door won't shut down again. Nathan rushes as if there's no tomorrow, until he arrives at the 2x3 room. There are a Slime and a Heat Shade together with him, the three forming the shape of a triangle. According to careful caculation, this is a good chance to take the two enemies down in one strike. Nathan jumps up, flings the whip out with all of his strength, and wow, he receives the <Venus> Card ("enchantment", 19/20) from the Slime and the <Jupiter> Card ("defense", 20/20) from the Heat Shade drop with one whip slash! Congratulations! The collection work is completed! Now it's time to finish what has been started. To go down inside the Machine Tower. To go through the bridge and down the tower in the Audience Room area. This time the "bridge" route wins out according to my tests. The remaining Hearts are run out for the last shot of the Cross to dispose the Hyena gunner. The rest enemies are postioned at some interesting intervals that Nathan can only take damage from the Hyenas, skipping all of the more hurting Were-wolves. Trivia: "Were-wolves" is the plura form of the noun "Were-wolf". A typical "jump-down-through-obstacles" challenge of the optimization skills. Nothing new. The item drops by Gargoyles are just for fun. Trivia: The big room on the top right belongs to the shattered Outer Wall area as well. Note: Alternately, ascend through the upper exit, go around the body of the tower, enter from the bottom exit and become slower eventually. Extra menu access is the culprit. The initial enemies in this room full of torn paintings have been replaced by normally pesky Wind Demons since Camilla was defeated. This is great in this run, as they just fly out of the way. However, the ground enemies in the G-shape room next to it are still there. Nathan still survives this situation thanks to the las 1 HP left. The ceiling of the beginning room is too thin to block the ascension, and Nathan is always a master of travelling on the roof. It now guards the upper-left corner of the screen and will kill Nathan if he shall go there. But since it can't move at all, Nathan can just jump over its head and get around of it. Problem resolved. Just before the final show-down, Nathan switches to the only proper DSS combo for it: the DSS Skeleton. This is the last time the in-game menu will be accessed in the run, so don't miss the chance to view the full collection of the cards for the last time! The "first round" has a fixed time for every kind of Dracula's attacks. I manipulated him to do the meteos attack that takes the shortest time. The attribute glitch and the trick to start Dracula's death animation early in the "second round" that can be seen in the glitch-warped "any%" run is not used here, because now I have all 20 cards and there's no need to switch the DSS combo at all, making the cost of utilizing the glitch and the trick too expensive to save time. The farther and the son have been waiting there long for Nathan. Glad to see Hugh has relived himself from his anxiety. Camilla was surely a liar. Master is completely safe and sound since the rescue. Hugh never fell into the darkness as she implied. There wasn't even a clash, but only a squabble between the two young men. We've witnessed everything through the whole run, haven't we? "all bosses": beats all bosses in the game. "all Magic Items": collects all Magic Items spreaded in the game, usually behind a boss. "100% map": gets a 100.0% completion rate of the in-game map. "all Max Ups": collects all of the HP Max Ups, MP Max Ups and Heart Max Ups. "all inventory entries": collects all possible kind of item drops that have unique entries in the inventory, as well as the Shinning Armor place in the Battle Arena. "max items in inverntory": like the above but has a requirement on the amount. "all blahblah": features whatever specific aspect of the game that can be made "full". arbitrary combinations of the above, including "completionist": all of the above except EXP, Levels, gameplay time, HP, MP, Hearts and maybe something else that I am unaware of. I could imagine more in details if the game had an in-game shop and/or a bestiary. This may feel familliar in concept and was attempted. Unfortunately, the original selling point, the boss fights in the game, are painted pale with abused DSS Skeleton big-bones and look repetitive quickly. This might seem too similar to the "all bosses" branch, given that it's basically faster to beat the bosses guarding the Magic Items than to skip fighting them. Since it isn't quite interesting to fight the bosses under speedrun requirements, it might be more interesting to see the bosses skipped if the goal is changed to encourage that such as in "pacifist" and "low EXP", but I don't want such limitations on this run. Trivia: ljffdb2 made a test TAS on a similar but more restrictive "low EXP, all Magic Items" branch, with some playaround in it. That run somehow introduced a meme: "27-year-old techniques" or so, due to some typo on its descriptions. This was attempted by zggzdydp, but got criticized for the "emptiness" feel not collecting remarkable items on the travels and rejected. Techinque-wise speaking, this doesn't leave much room for use of skipping tricks, as it requires to visit all rooms in the castle. There are only rooms for some minor tricks to surprise the audience such as revealing the entrance to a hidden room for later access. The "all Max Ups" branch was suggested as a substitute for this. This might be familliar to the Metroid series players. The collecting work is very visible to the audience. Unfortunately, it still requires to go through most of the rooms in the castle, allowing little room for skipping tricks as many would be slower than to collect the Max Ups in with the intended abilities. It also has a small problem that the completion can't be directly confirmed without calculations in the end as Nathan's level affects his stats where the collection rate is reflected. Nonetheless, this branch might be more suitable than the "100% map" for most people, as the "emptiness" feel haunting the "100% map" should be dispelled with the Max Ups, while the limitations of techniques shouldn't be worse. This relies heavily on luck manipulations and will surely look different from a non-TAS. A downside is that this branch suffers from almost the same "trick hunger" problem as the "all Max Ups" branch does, but the situation might be not as bad. It surely suffers from the difficulty to confirm the completion in the end without additional work, and suffers harder. Some might be interested in seeing the Shinning Armor, which could be an additional goal to other branches instead of this one. This was proposed as a joke by me. Seriously, I can't see any benefit in entertainment from getting the extra drops. Nor am I going to discuss other joking "100%-ish" branches here. This has almost all of the drawbacks of the above. The whole point of it is to satisfy some taste of "completionism", which does not fit my desires stated above. Note: Even some normal players will build up Nathan's level to 99. How could a true completionist player not do that? Some of these branches might be interesting to see, perhaps with some additional restrictions, to showcase some different aspects of the potential of game's content. However, most of them won't find much use of their completions in the running, and none of their completions will be manifested by the game. I don't find any of them superior to the "all cards" branch fitting the role of "the 100% speedun" for this game. Even if they were, they wouldn't make "all cards" look duplicated, as this branch demonstrates a unique route that is unlikely to be taken in other branches. If this submission is accepted for publication, there are some thoughts about the structure of the runs of this game. As explained earlier in the text. The currently published run can be optimized further with an up-to-date technique set and better execution. We have had old runs obsoleted with new runs on new branches, while still leaving the door open for newer runs on the old branches to be accepted and published. I have no particular suggestions purely basing on these "strategies". I would rather suggest considering about the deprecation of the whole "warpless" branch. The current "warpless" is criticized for not defining a clear set of criteria and sololy relying on forbidding selective glitches, which feels arbitrary. Following the current trend to have things defined more clear and verifiable, this should be fixed. If we want a "warpless" branch and just clarify the de facto criteria eg. "no zipping or going out-of-bound", according to currently known techniques, it's possible to skip more areas than the current "warpless" publication and even the "Magician Mode warpless" run by McBobX do to finish the game without using zipping glitches or going out-of-bound once. The resulted run will have the Necromancer, Adramelech, Dragon Zombies, Death and either Iron Golem or Camilla boss fights skipped, plus the Battle Arena as well as most part of either the Machine Tower or the Underground Waterway in whichever the boss in it is fought. That is more than half of the game. Could the original point of this branch to "show more of the game" still stand then? I doubt that and would rather suggest such a "warpless" branch be deprecated in favor of something else. If we just want a "warpless" branch that "looks" like the currently published run, we have to elaborate what specific glitches are disallowed, which would receive heavier criticism for being more arbitrary on the criteria, and could strangle futher innovations involving glitches, leaving only rooms for optimizing the executions. I wouldn't be in favor of this outcome and would rather suggest such a "warpless" branch be deprecated in favor of something else. If we want a "warpless" branch forbidding only the "arbitrary DSS combo" glitch, the run will be much slower as most of the useful DSS combos for speedrunning will not be available at all, and might look too similar to a proposed "Fighter Mode" run that disables all DSS combos along with most of possible glitches in the game but has higher power in physical attack and defence. This would disapprove every published run on the current "warpless" branch, and virtually just reassign the branch name to a different one. Similar things have happened with games without an ending. I wouldn't oppose this if it weren't to prevent a "Fighter Mode" run from being accepted and published along side. Frame 39044 or 39050, where Nathan dances with the Fallen Angel in the moonlight. This project was actually started before the glitch-warped "any%" run. The researches on this project helped making the glitch-warped "any%" run. The luck manipulations on enemies' actions and drops, which have to be redone in every version of the run, and this submission is v10. Thanks to all previous players who demonstrated the techniques and tricks of various runs of the game. Thanks to hellagels for the Nicovideo encode. Entertainment is on point, lots of fun tricks and glitches. This particular goal shows off ways to break more of the game than the current branches. I would hesitate to label it as 100% completion (especially due to the presence of a counter that tracks map percentage), and I do believe it could potentially be obsoleted by a run that completes more of the game than this but this definition is perfectly acceptable as it is. The audience really enjoyed the run too. There was discussion as to what to do with  GBA Castlevania: Circle of the Moon (USA) by Cardboard in 21:40.22. This run and that run have very different goals, with that one being more focused on showing what is possible within the game with minimal glitches and demonstrates tight platforming whereas this one being focused on collecting certain major collectibles using whatever glitches available. There were multiple potential suggestions for what to do with it but from what I can tell, this submission should not obsolete that publication and unless a run with a more comparable goal were to appear, I see no reason to obsolete that run nor why questions regarding it should hold up the acceptance of this submission. Spikestuff: We're going to play a game called "52 pickup".